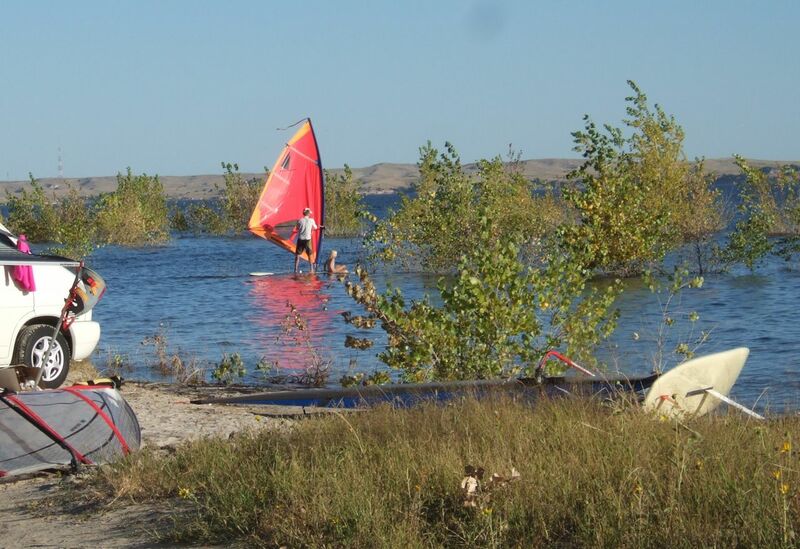 "Once upon a time, in a land far away...The boards were long, the clothing was neon and the harnesses were few and far between"
I took the above sentence from Larsons Ski and Sport's website; they hosted the Toucan Open on Lake McConaughy in Nebraska in mid September. Because this event has been going on for decades I thought the above sentence was most appropriate to describe the event's provenance and also remind people of why we go to events and why there are events at all. I arrived the evening before and the lake level was high, and so was the wind! People attend events and gather for varieties of reasons and I won't attempt to speak for everyone. 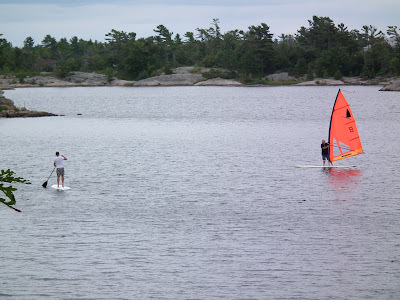 But from my point of view windsurfers get together to have fun, improve our sailing skills, spend time with friends, family and maybe make some new friends along the way. It's also a great excuse to travel and explore. Beach camping fills in and the wind outside picks up. 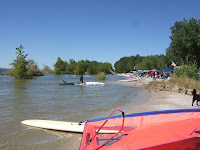 I had been to this event in the 1980s during the height of Windsurfer One Design races. 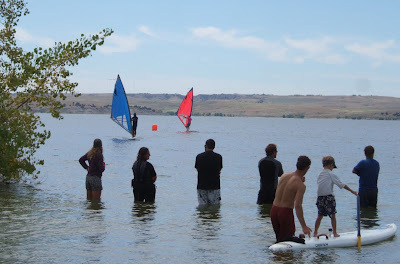 It was more than a regatta, it was an event. People from all over gathered and they were excited to be there, they were part of something and you could sense it. Some were there to win, some were there to race better than their last regatta, and some came to just finish a race. Toys for all ages scattered on the shoreline. Karen Mariott, her sister Brenda with help from brother Ryan and their mom Joanne hosted the Toucan Open. They've been keeping it going and make it a welcoming environment. 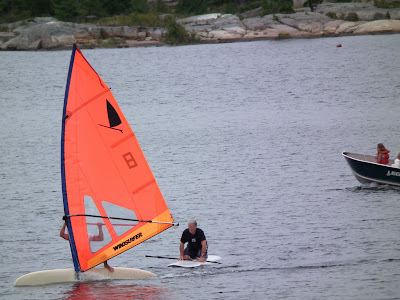 I raced on my new Original Windsurfer and had some good fun races. The first day was windy so after wearing myself out windsurfing I joined a few guys surfing the swells that were rolling into the beach. It's amazing how much fun you can have if you want to. 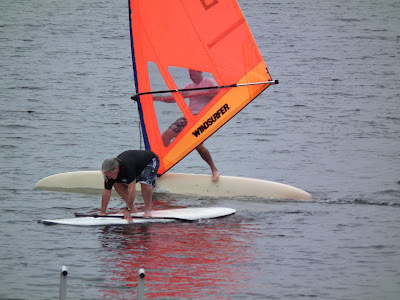 Photo: Trying the Windsurfer for the first time. I brought a couple boards and several people took them out for a spin. 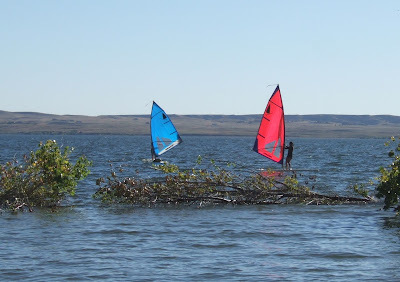 It was fun for me to see people discovering the Original Windsurfer–something that's been around all along, they just haven't been exposed to it. The last day brought light wind. 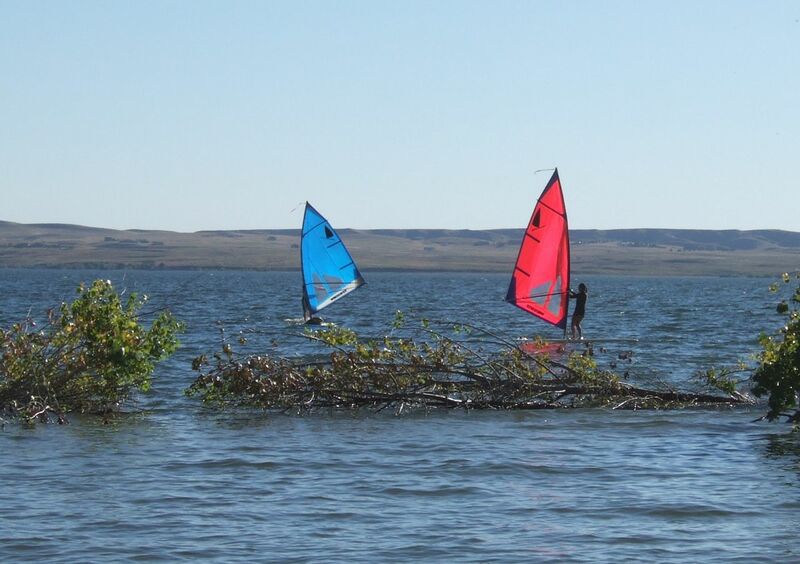 Someone recommended a Slalom Relay Race sailing on 2 of the Original Windsurfers (no it wasn't me!) and Karen made it happen. Within 30 minutes 2 marks were set, and two teams were ready for the challenge. Each team had 7 sailors. 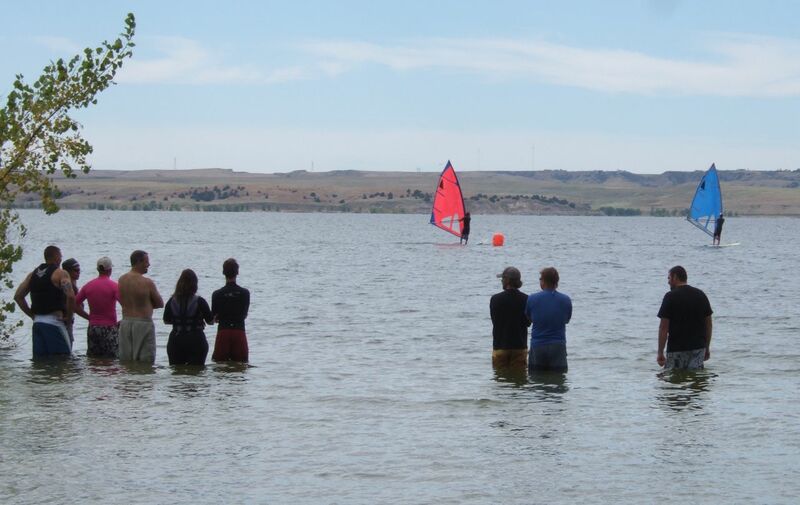 The course was to sail around the buoys and then hand off the Windsurfer to your teammate. I think it's safe to say most of these people had never sailed a Windsurfer, or if they had, not in the last 25 years. For most of them it was their first time on the board and now they were racing on it! "that is 'pure' sailing...it's so simple and pure". 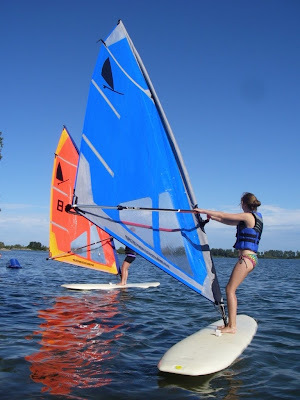 "that's fun, the board is so responsive and the sail is so light!" It was the Blue team against the Red team. I had met all these new people over the last 3 days, and now we were working together–or against each other–to win! The wind was light but the spirit was high; we were engaged in the task at hand, beat the other team. I was the last sailor for the Red team and regretfully I didn't sail down and away from the last slalom mark to knock the opponent on the Blue team off his Windsurfer. It's hard to knock someone you just met off their board. Sorry red team. Now that I know these fellow sailors better and they know me, next year I won't hold back. Watch out Blue team. This guy took a cruise up and down the shoreline with his daughter on the front of the board. As the final sunset for the weekend set across Lake McConaughy the world surrounded by windsurfers feels like a smaller and happier place to be. I am thankful to have had the opportunity to gather at this event to sharpen my sailing skills, have some fun and make some new friends. 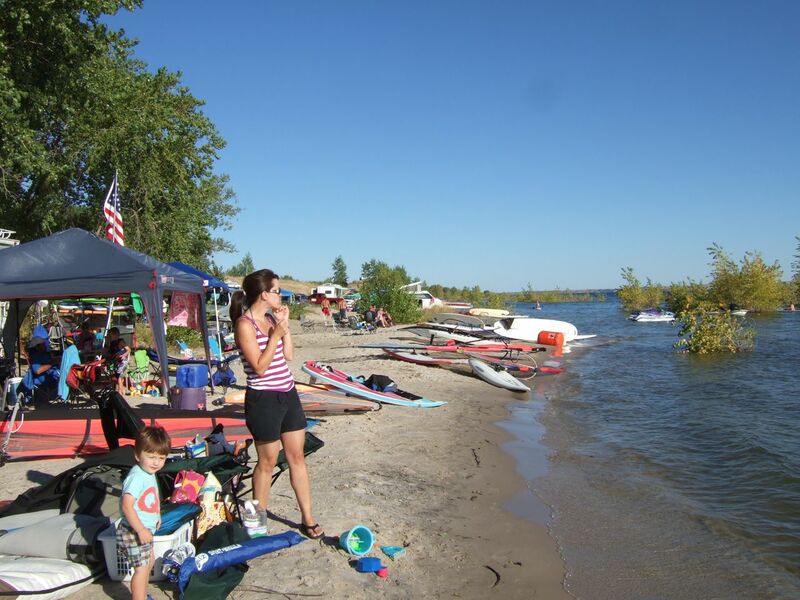 Thanks Karen, Brenda and family for hosting and continuing to provide a venue for windsurfers an event and weekend worth coming to. 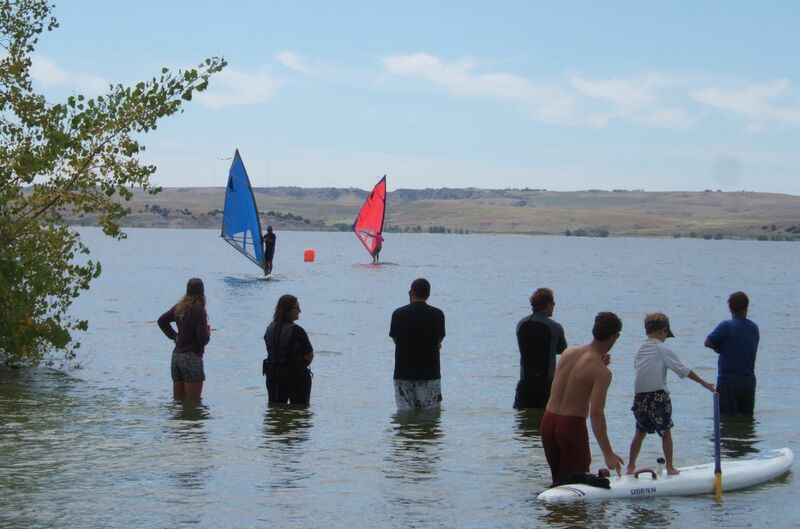 Closing comment: Do you have a local windsurfing community? Leave a comment about what makes it work for you or what you envision it should be. 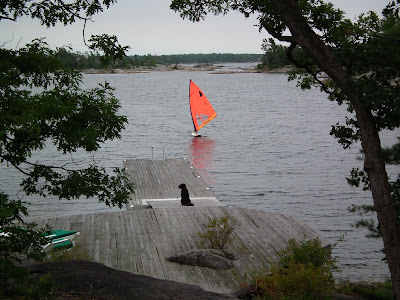 Is it all about sailing for you or maybe it's social first, then sailing? Or maybe you just want to go fast by yourself; hey that's okay too. 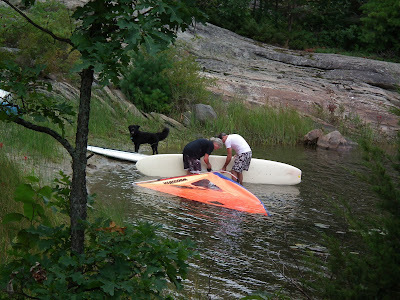 In August I loaded the van with a few boards, the dog, and drove to Canada. 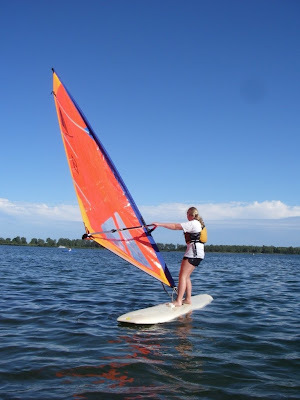 My first stop was Toronto at the Toronto Windsurfing Club for a Freestyle Demonstration and their Wednesday night series. 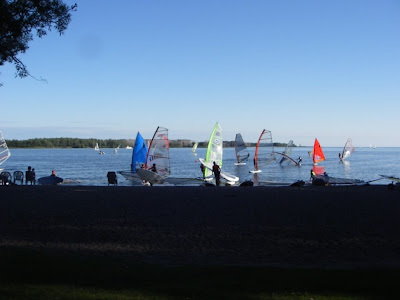 I was invited by Tom Mae who is President of Windsurfing Canada and an avid windsurfer sailor. They have a sweet facility very close to downtown with a big beach. 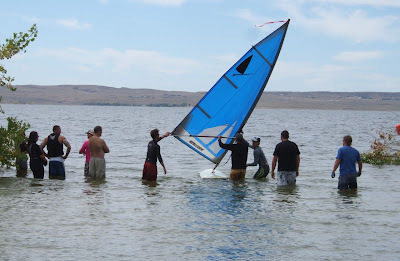 This seemed like a club where members drop in to check the wind and visit with friends in addition to windsurfing. Throughout the afternoon and into the evening several people introduced themselves to me and shared their windsurfing stories. 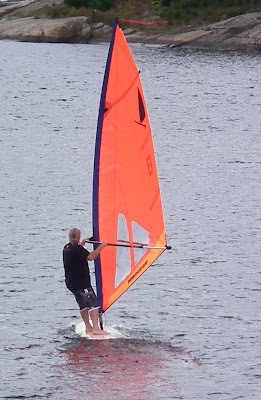 Some weren't sailing in the evening race but wanted to come down to the club to see the "new" Original Windsurfer and say hi. 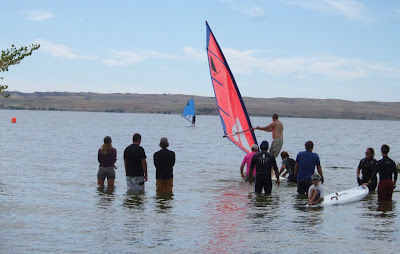 The wind was light but I continued with the Freestyle Demo anyway and then took questions back on the beach from the "Kids Camp" students who had finished their day of windsurfing. They were kinda quiet so I kept talking, then one of them raised their hand and asked if she could try the board, then there were more hands, "me too, me too"! They sailed the 2 boards I had rigged and one guy even did a back-to-sail (impressive) and 2 of the gals were having a ball and just kept sailing around, tacking and gybing. Back on the beach I asked them what they liked about the board and they all agreed they liked how responsive it was and how easy the rig was to use. Next was the evening race. The wind was still light but that didn't stop this lively group of sailors from having a good time. 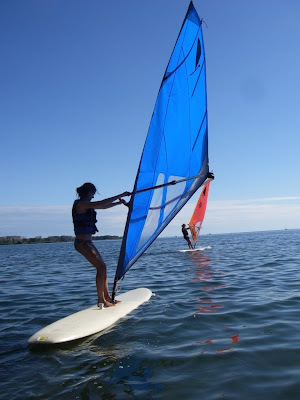 A gal named Andree Gauthier sailed the 2nd Original Windsurfer and in no time it felt like I had been sailing with this club for more than just that evening. 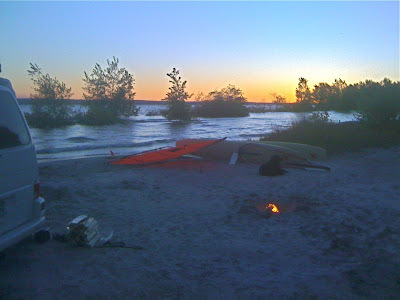 After a BBQ and loading up the equipment I left Toronto that night heading north. Map and near the famed cruising grounds of The North Channel. Some crazy couple originally from California wanted a new Original Windsurfer and I (being also a crazy guy originally from California) volunteered to deliver it since it was kinda on my way home from the Demo in Toronto and they're kinda my parents. 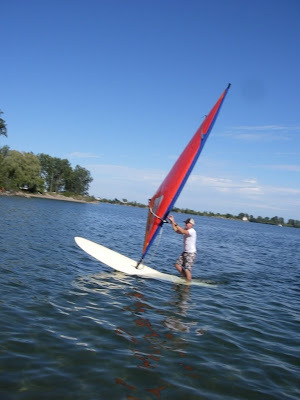 Oh, but I forgot to mention that while I was driving to Toronto I got a call from a guy in California and he wanted a new Original Windsurfer...and guess where he wanted it delivered? "Cottage Country" but even farther north. You just can't make this up. 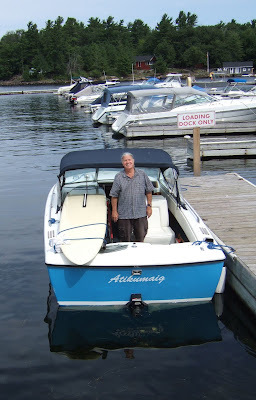 Everything has to be taken out by boat to the Islands. Here's the excited new owner. 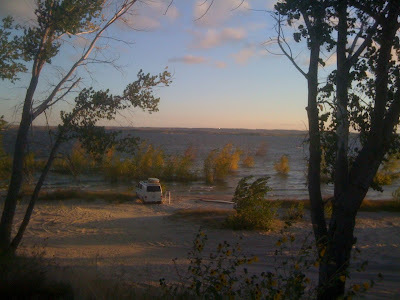 It was too far to windsurf after 2 nights of sleeping in the "van" with my dog Roscoe. 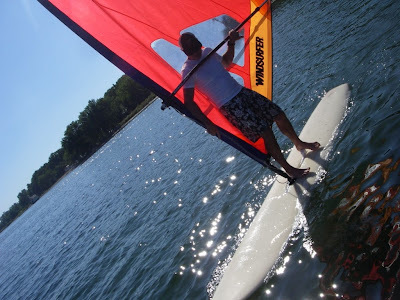 Hoyle's 1st sail on a "new" Original Windsurfer. Over 40 years later, he's still got it. He was having too much fun so I paddled out to him to see if I could knock him off and pirate his new toy. did some freestyle, then took a long sail around Lambert Island. My next stop was delivering another board to the northern part of Lake Huron. After that I drove back to Michigan. 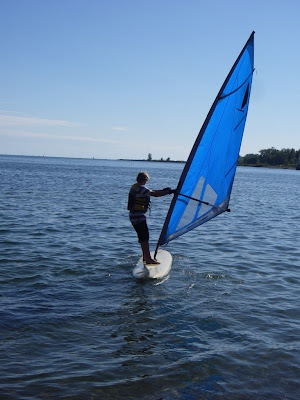 I look forward to another sailing session with the Toronto Windsurfing Club and another stop to sail with family.